Chop and slice the cauliflower into smaller chunks. And then, use a food processor to mash them. Process them until they look and feel like white rice. If a food processor is not available, you can use a cheese grater or chop the cauliflower by hand. Take a pan and put it over medium heat. Heat coconut oil. Slowly add the turmeric, ginger, and cilantro. Stir for several seconds. Put in the kale and cauliflower. Stir fry the veggies for a couple of minutes until fragrant. If you think the cauliflower appears dry, add 2 tablespoons of fresh coconut water. That way, the ingredients that are stuck at the bottom will loosen. 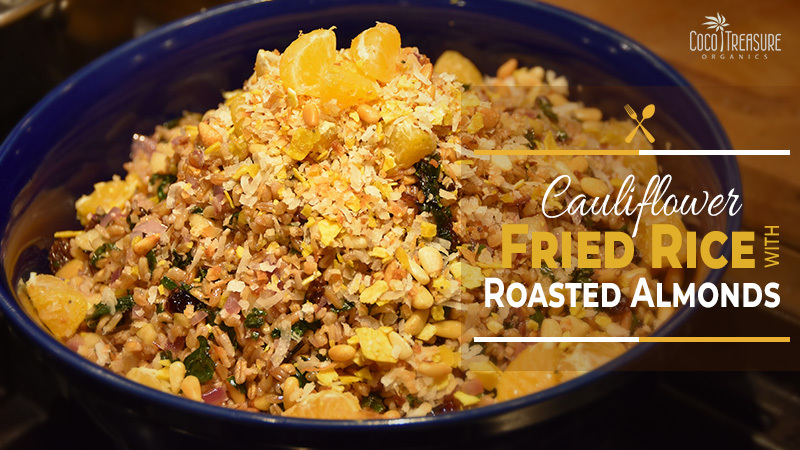 Pour the beaten eggs carefully and mix until it perfectly blends with the cauliflower. Sprinkle the chopped parsley, coriander leaf, spring onion, and mint. Fold in the mirin, tamari soy sauce, and tamari almonds. Squeeze a bit of lime. Not everybody can set aside an hour of their weeknight to prepare one delicious meal. That is why we came up with one quick-and-easy dish you can make in just a blink of an eye. 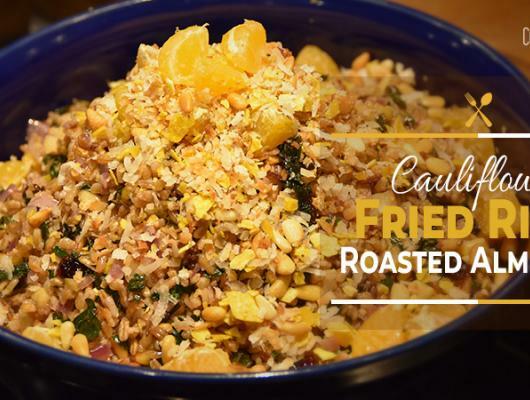 This Cauliflower Fried Rice with Roasted Almonds can be whipped in a few minutes for those nights when preparing a sumptuous dish for the family seems too difficult. Just make sure you have all these ingredients in your pantry and you will be as good as gold. Now, hands up if you are looking forward to trying this dish! There’s just so much going on in this recipe – nutrient-packed ingredients, vibrant colors, and a must-try combination of flavors, of course. Share this oh-so-good recipe to your friends! They’ll thank you for doing so.